Staking is a great way to earn a passive income whilst helping to provide essential security for the blockchain network. We have worked to ensure that staking is accessible for everyone who owns XSN. Staking is the act of holding Proof of Stake (PoS) coins in a staking node to mint (or forge) new blocks. Minting (or forging) is the act of creating new blocks in a Proof of Stake blockchain to have a chance to receive a block reward. A staking node is a computer that runs the coin’s wallet with a positive coin balance. The wallet will automatically stake by using the node’s resources to protect the blockchain by verifying the legitimacy of the transactions. For its services, the blockchain will send rewards (coin payments). Rewards are based on the number of coins the wallet owns; the more coins the more chances there are to receive a reward. The node must always be online or it won’t be staking and therefore not receiving rewards. With XSN every block produced mints 20 XSN and these are split 45% (9XSN) to staking nodes, 45% (9XSN) to Masternodes and 10% (2XSN) to the treasury to pay for development. Staking secures the network while Masternodes provide services for the network. If you want to learn more about Masternodes check out our latest Masternode article. How do I start staking with XSN? XSN Cloud staking pool involves sending your XSN to our Cloud website. To get started, you simply need to create an account and send XSN to your wallet address. After 24 hours your funds will begin staking automatically and you will start earning a share of the block rewards the Cloud receives. As it is pooled staking, the coins from all users using the Cloud service are pooled together to make one large staking wallet. Over 8 million XSN is currently staking on the Cloud. As rewards are earned they are split between all the stakers in the pool. This means you get smaller and more frequent rewards paid into your wallet as opposed to full block rewards of 9 XSN at a time as you would using other methods of staking. It is important to note that our Cloud service is a centralized service and as such does carry the risks associated with using centralized services. It is the same as sending your coins to an exchange where you have to trust them with your assets as you do not own the private keys to them. For this reason, we strongly only recommend using the Cloud for smaller balances. Wallet staking involves running the XSN Core Wallet 24/7 with your XSN in it. To get started, you just have to install the wallet, send your XSN to it and leave it unlocked and running, after 24 hours your XSN will be eligible to receive staking rewards. You can activate “unlock for staking only” within the wallet for extra security for your XSN. This means nobody can move your funds without using your passphrase to unlock them to keep the coins secure while leaving the wallet running on the computer. With this kind of staking you win full block rewards, so every time you mint a new block, you will receive 9 XSN. You can begin normal wallet staking with any amount of XSN in the XSN Core Wallet. You are required to keep a constant internet connection to your wallet however to stay synced with the blockchain. If your connection to the internet is lost for some reason you will have to wait 24 hours upon reconnection until your balance becomes eligible for rewards again. 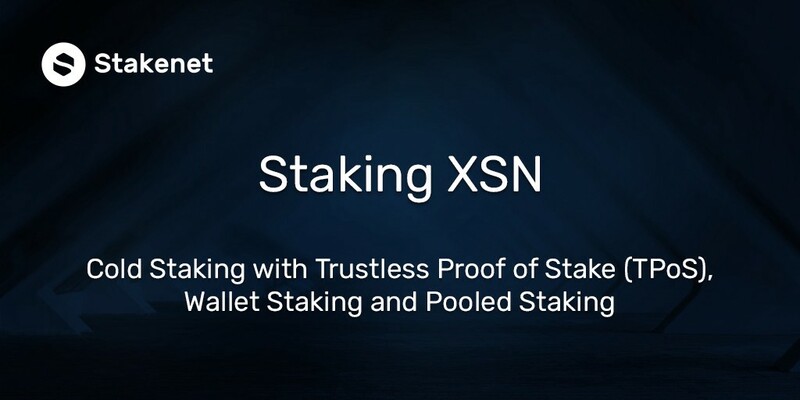 Cold Staking with XSN is achieved through a Stakenet original technology called Trustless Proof of Stake (TPoS) which allows you to stake from cold storage. TPoS offers the greatest level of security to your XSN as your balance is kept offline (not connected to the internet so is not at risk of hackers, for example). Once the TPoS contract is set up, you can take your wallet offline and then in a few days, weeks, months, years, just open up your wallet and all your rewards earned will be there waiting for you. You can use TPoS via the XSN Core Wallet but soon you will be able to use it directly from hardware devices such a Trezor and Ledger as well as our own hardware device XSN Viper X, turning them into cold-storage staking devices. We will also be adding TPoS to our new multi-currency wallet XSN Viper Light. TPoS uses a Merchant Node to take your place on the network to maintain blockchain security. A Merchant Node can either be run by yourself or you can hire a merchant to run the contract for you and pay them an agreed % commission of the block rewards your win. When you set up your contract for TPoS you just need to input the address of the Merchant Node that will be providing the network security in your place, the amount of XSN you wish to stake and finally the % commission that has been agreed if you decide to hire a merchant. With TPoS the merchant has zero access to your funds so there is no risk to them, they can not touch them. You always have full control and can cancel the contract at any point in time. Any block rewards you win are automatically sent to your address minus the agreed % commission which is sent to the merchants address. We believe with TPoS we have achieved the simplest, most secure and fairest cold staking solution currently on the market for both users and the network it protects. We have many new features in development to make staking even easier and more flexible. One of these developments we will be working on is adding TPoS contracts to our Masternode Network. The vision behind this is to make cold staking as simple as clicking a button and will allow users to simply just click to start cold staking, automatically assigning the TPoS contract to a Masternode before staking begins. This has an additional benefit for Masternode owners, by providing another revenue stream for them in the form of commission earned from the block rewards. Another feature we are developing is Cross-Chain Proof of Stake (CCPoS) which will allow you to earn rewards in any other coin using your XSN as collateral. So if you want your rewards to be paid in BTC, LTC or another coin you can. With CCPoS you have a level of flexibility to switch rewards as you watch the market. Maybe that hot new coin is at a low price right now so you can switch your rewards to be paid in that instead to earn it passively. We are currently working on the development of innovative staking solutions, Lightning Network technology, Masternode Network advancements and our own line of hardware devices, and we welcome you to join us on Discord and follow us on Twitter to stay up-to-date with our latest news and developments. 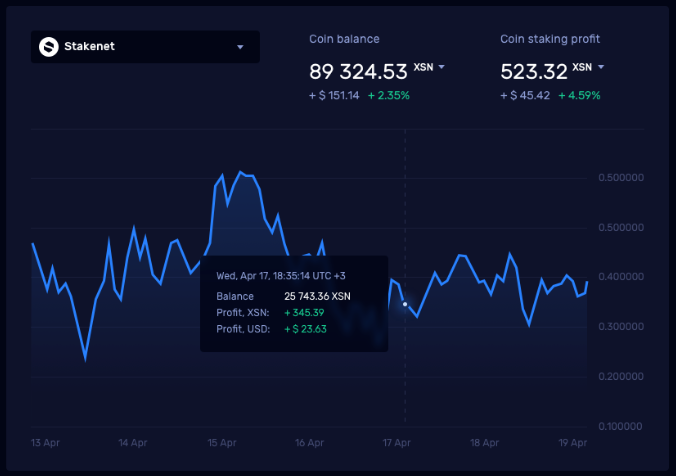 Stakenet (XSN) revolutionizes the way cryptocurrencies are held, spent and staked.